Co-authored by Kathi Appelt and Alison McGhee is about a family twice struck by tragic death. Sisters Sylvie and Jules are close and just one year apart. At ages 11 and 12 they both miss their mother who died suddenly years ago. Raised by their father in a small town in Vermont, they are warned not to go near the Slip, a dangerous part of the river. One March morning while waiting for the bus together, Sylvie races off to throw a ‘wishing’ stone in the river. Trying to prevent her sister from breaking the rule not to go, Jules is unable to stop her. When Sylvie does not return, she discovers she must have slipped on the snow and drowned. Along with the story of the sisters is the story of a family of foxes and 3 new kits. The connection between the baby girl fox and Jules conveys the strong natural atmosphere and elements of people and our part of a greater world. 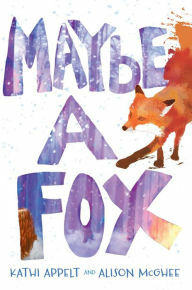 The voice of the baby girl fox as she feels a pull to watch Jules delves the reader into the animal, spiritual world. Other characters in the story are also brought in as they experience the loss and grief of Sylvie as well as their own. This entry was posted on May 5, 2016 at 6:26 pm and is filed under Adult Readers Advisory. You can follow any responses to this entry through the RSS 2.0 feed. You can leave a response, or trackback from your own site.